The Latin Term Status Quo is defined as the existing condition or state of affairs. In popular parlence, Status Quo means simply the way things are. In international law the Status Quo denotes a situation, actual or legal, that exists or once existed and whose reinstatement or preservation is in question. In this land where facts on the ground are continually being established for political advantage, it would seem that the Status Quo can only be something imagined, except for the situation of the church and the Holy Places of Jerusalem and Bethlehem. 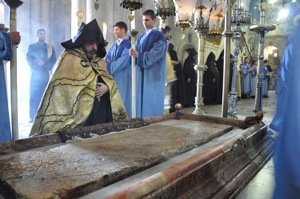 In the Holy Land, the Status Quo refers a firman issued by the Ottoman Sultan Abdulmecid I on Feb. 8, 1852 to freeze the conditions of ownership and responsibility as a legal framework to resolve disputes concerning the church of the Holy Sepulchre, the Tomb of Mary, and the Church of the Nativity. According to the Status Quo, the way things are in 2012 at these Holy Places is the same as the way things were in 1852. 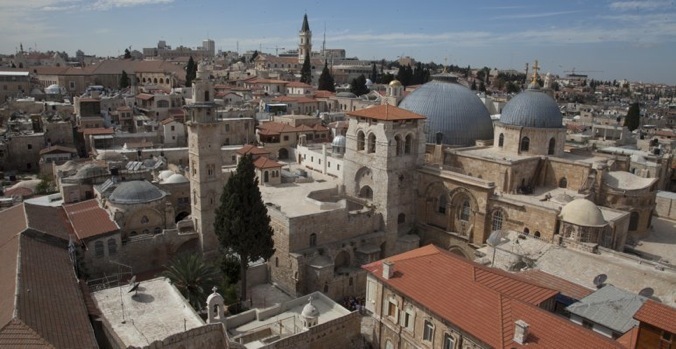 If the most common words in the church at large are "we never did it that way before," the saying goes a thousand times over for the Holy Places of Jerusalem and Bethlehem. The Franciscans are considered the Custodians of the Holy Places, because this was the appointment of Pope Clement VI in 1342. The Greek Orthodox Patriarch is the official representative for the whole Christian community as was determined at the beginning of the Ottoman Empire in 1463. The Armenian Church has a special place alongside the Catholics and the Orthodox because of a declaration by the Sultan in 1829 in gratitude for Armenian service to the Empire--an especially ironic sitution in view of the subsequent Armenian Genocide. *Two Muslim families-- Nusseibah and Judeh-- hold the key to the Holy Sepulchre and ceremoniously unlock the doors each morning and lock them each evening. * After closing each night the Greek Orthodox have priority in the Holy Sepulchre saying their liturgy from 12:30 a.m. to 2:30 a.m.
followed by the Armenians from 2:30 a.m. to 4:30 a.m.
followed by the Franciscans from 4:30 a.m. to 6:30 a.m. finishing in time for the unlocking of doors to begin a new day. 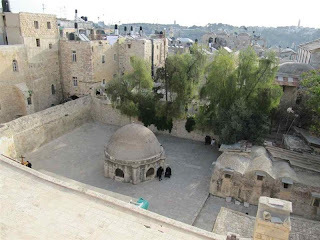 During the summer months, while Jerusalem follows daylight saving time, the Church of the Holy Sepulchre follows Winter time/ Standard time because there was no daylight savings in 1852. In Bethlehem, the Armenians celebrate Christmas on January 19, although a recalculation of their calendar allows Armenians in the rest of the world to celebrate Christmas with the Orthodox on January 6. Repairs and cleaning are regulated by specific instructions--when boundaries are crossed, fights ensue, and the church endures terrible publicity in the media. 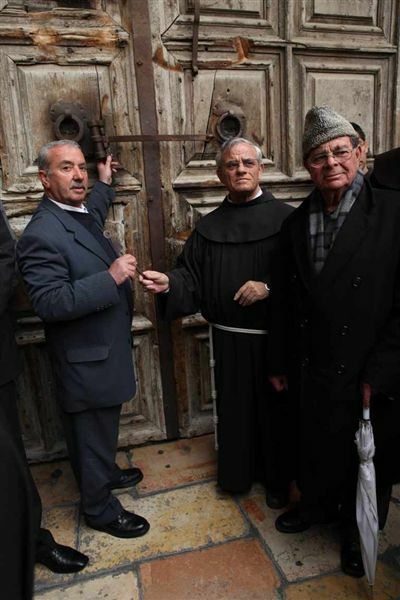 Three other churches are guaranteed a place in the Church of the Holy Sepulchre. * The Coptic Church on the backside of the Tomb of Christ. 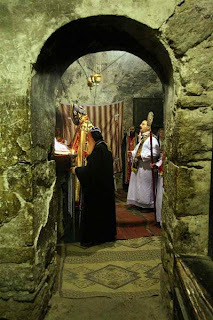 * The Syrian Church in the Chapel of Joseph of Arimathia and Nicodemus in a room hidden away on the perimeter. * The Ethiopian Church in a humble mud hut compound on the roof. 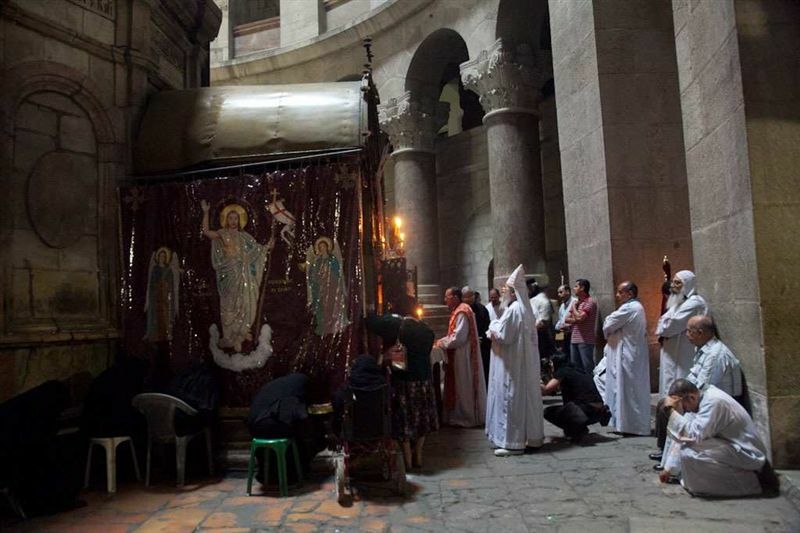 Anglicans and Lutherans are not included in the Church of the Holy Sepulchre and the Church of the Nativity, because they showed up later on the scene. Tthe Church of the Holy Sepulchre and the Church of the Nativity operate in 2012 as they did in 1852. Many people misunderstand the Status Quo because they see it primarily as an ecclesiatical arrangement, while in reality it's a political agreement that has ecclesiatical ramifications. The Status Quo firman of 1852 is a lasting by-product of the colonial quest of European Nations-- with France and Russia initially squabbling over their rights in the Holy Land, played out of the ground by the Franciscans and the Orthodox. 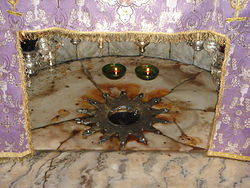 The straw that broke the camel's back was the removal of the silver star on the marble floor commemorating the place of Jesus "humble" birth in the Church of the Nativity in Bethlehem-- because the star's inscription was written in Latin. It was removed by the Greek-speaking Orthodox in 1847 resulting in the Crimean War, a formal protest by the French, and the Sultan's firman in 1852 of the Status Quo. As for the European Countries, while they were busy carving up the map of Africa for their colonial ambitions they also ratified the Status Quo in the Treaty of Paris in 1877 and the Treaty of Berlin in 1884. The result is that the Status Quo removed the interaction among Churches in the Holy Places from the secular realm to the ecclesiastical realm. No secular power, whether it be Russia, France, or the United States—whoever may be the world power of the day—will change this status of the Holy Places. Nor will the government ruling Jerusalem or Bethlehem whether it be Turkey, Britain, Jordan, Israel, or the Palestinian Authority. So while it seems so strange to be fixed on the past, the Status Quo does protect the Holy Places to some degree from outside intervention. So here it is 2012, and just a stone's throw from Redeemer Church is the Church of the Holy Sepulchre in some respect frozen in time by the Status Quo. Our lectionary readings over the last six weeks have lead us to reflect on this interesting phenomenon because the Gospel readings have all come from the central section of Mark--chapters 8 to 10. Three times in three chapters, Jesus has said powerful things about death and resurrection--that the Son of Man would be handed over, suffer, be crucified, buried, and only then raised from the dead. This is a reminder that we are always living in the shadow of Golgotha and the cross, especially here at Redeemer in Jerusaelm. Three times the disciples have demonstrated that they just don’t get it: In chapter 8 it was Peter who took Jesus aside, scolding him, and pledging that he would never allow this to happen--he would do his best to continue the Status Quo of a comfortable life in Galilee. In chapter 9, it was the disciples as a whole who argued in response about who was the greatest. And now in chapter 10, James and John, offer this rather pushy request to sit in the places of honor when Jesus comes into his glory, as if they expect to take a short cut around the cross, and fast-track to the glory road. For the disciples, it’s all about status and rank, or so it would seem. It’s the way of the world, as the Gentiles do, in Mark’s words, or in political election campaigns when people line up in hopes of future rewards as prestigious appointments for campaign contributions, or special endorsements. And we are living here in the shadow of the cross, a stone’s throw from the Church of the Holy Sephulchre where status is so important, where we find a whole hierarchy of titles, from Patriarch, to Archimandrites, to Bishop, and terms of address like your grace or your beatitude, where seating arrangements are important on occassion like yesterday afternoon when we visited the Armenian Patriarchate to offer condolences over the Patriarh's death, where the Status Quo agreement of 1852 is fixed in stone. Yet in a city marked by status and status quos, our Gospel readings over these last six weeks have reminded us that it’s not about status and status quos, but about earth-shattering reversals and downward mobility, where the first shall be last and the last shall be first, where the Son of man comes not to be served, but to serve and be a ransom for many, where discipleship involves a separation from wealth and physical possessions for the sake of the poor, and where Jesus sets a child in our midst and announces that of such is the kingdom of God.